I completed Angel of Hope just before Christmas....though I've held off in giving her as a gift until I finish Coral, so I can give them at the same time. I may have to buy a 4th bin, as it's starting to get tight in there! Let's see...what else did I accomplish..... oh yes, I finally finished gridding up the first vertical section and first horizontal section of Cathedral. I can't decide if I should finish gridding up the entire piece or just start doing some stitching!! 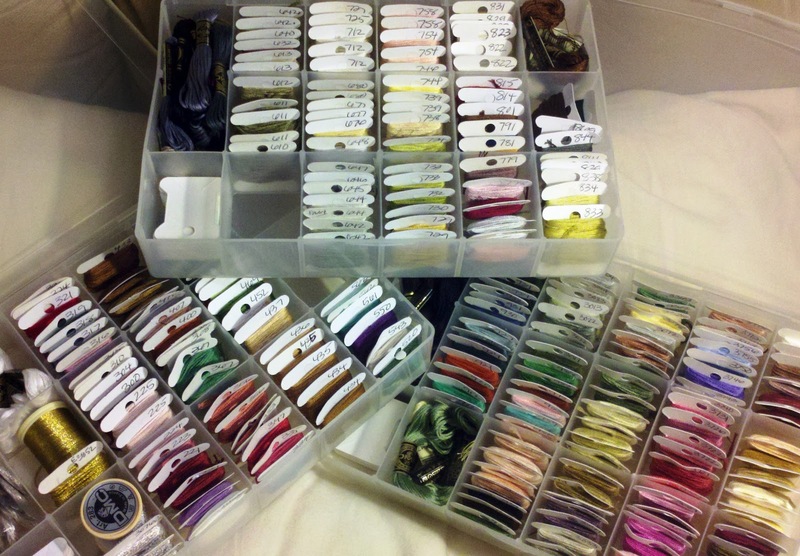 I also spent some time and got all the floss sorted and pre-cut, so everything is ready to go! Let's see....I also got some gift cards to Joann's (can never go wrong with gift cards!) and daddy helped Kella get me a new HAED chart that I'd been vying for: A Princess is Born She's definitely getting added to my 2012 WIPocalypse list, which I'll need to shorten due to adding some sewing projects into my goals. I survived the main holiday without gaining too many pounds....I'm back on track on my diet and I'm excited to kick off the new year with my weight-loss goals. What New Year resolutions is everyone making? 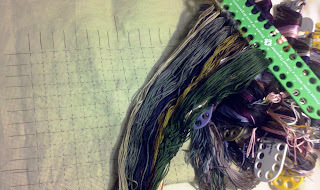 Besides the diet goals, I'm resolving to clean up my old craft projects and get them done (to make room for new ones!). I have so much yarn that I definitely need to knit or crochet something!! Cleaning up my crafty stashes will probably mean some giveaways....I have so much stuff!! I hope everyone had a wonderful holiday and that Santa spoiled each and every one of you!! She came out beautifully! Congrats on a finish. I have 6 of those bins filled, along with tins and a couple of drawers - but seems every project needs a skein purchase or two! Enjoy your new machine, so pretty. Congrats on a beautiful finish. Such a beautiful finish! That's a great idea to cut your lengths of floss for a project. I have been thinking of doing that too. Congrats on that beuatiful finish. Oh, you finished Angel of Hope. Congratulations! She's gorgeous. Enjoy your new sewing machine. Hope you have a wonderful new stitchy year. A gorgeous finish Lesli and I love your sewing machine. Angel of Hope is fantastic!! Enjoy your new machine. Oh she's gorgeous! Congrats on the finish! 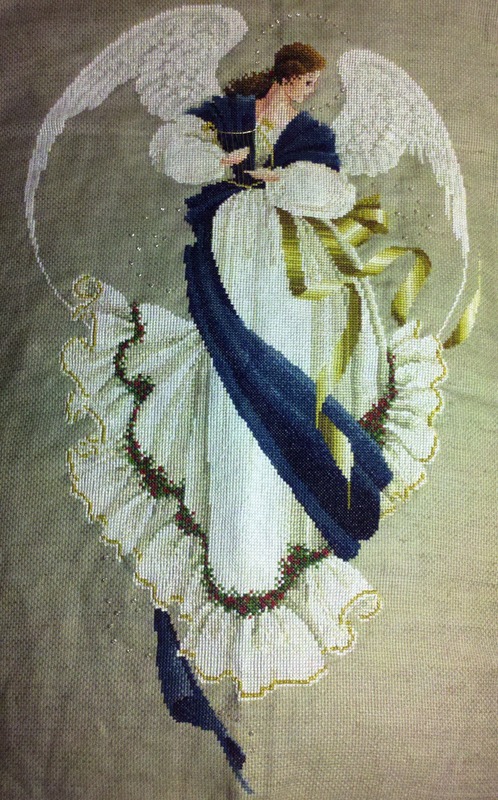 Thanks everyone, for the great comments on my Angel...now to get her framed and gifted! Congrats on the finish and such a wonderful gift of a sewing machine! congrats on a really beautiful finish! 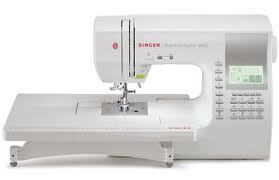 I love my sewing machine so I can truly say what a wonderful present you have received from Santa. You must of been a very good girl throughout the year.